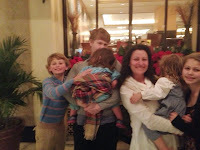 For Thanksgiving 2014, we went to the Peabody Hotel with my Mother-in-Law and her boyfriend. It was a great meal and a beautifully decorated hotel! Everyone had plenty to eat and had a great time! 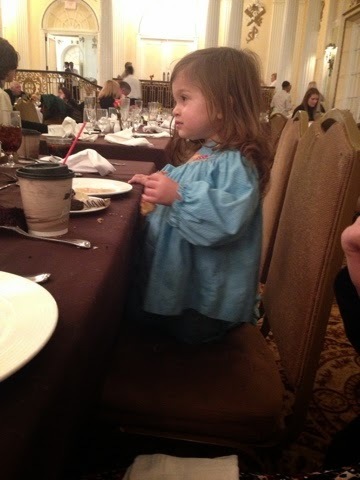 Dilly had a great time being dressed up in her outfit and really loved that the waitress brought her lots of desserts and hot chocolate in her own cup! 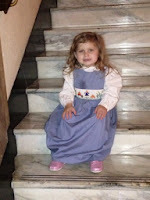 Lissy really enjoyed being dressed up. Even though she refused to smile for our family photo ... she looked pretty adorable sitting on the steps in the lobby.